The independent transport videos cameras are no strangers to the streets of Liverpool. Having filmed the excellent Merseyside Transport Trust (MTT) annual running day events since 2007, we thought it was time to visit Liverpool to record and capture the contemporary bus scene. Two visits were made in March and May 2017 to see what was operating and to bring you this DVD programme. The two main bus operators in Liverpool at the time of filming are Arriva and Stagecoach. Arriva North West & Wales incorporates five operating companies and covers an area almost similar to the erstwhile Crosville Motor Services that of course operated in the city up until the late 1980s. The Stagecoach Merseyside & South Lancs company also covers some of the former Crosville and Merseyside PTE services as well as Ribble Motor Services that also ran in the city! Of course this era is still remembered by the MTT running days – but now back to the present! Filming begins at the Pier Head on Strand Street where the early morning action is captured on this very sunny spring day. We move to James Street and see the Yutong electric demonstrator single-decker, YK66 CBC in service in Arriva livery. Filming continues in Castle Street, Lord Street, Sir Thomas Street and Whitechapel. We see brand new Arriva hybrid Volvo B5HL double-deckers with Wrightbus bodies, some so new that the branding has not yet been applied. We then spend some time recording the action at the busy Queen Square Bus Station where buses from both companies run through in both directions with plenty to see. Filming then continues at St George’s Place, Lime Street and Old Haymarket, the busy road by the mouth of the Queensway Mersey Tunnel. Here we see a number of independents taking visitors to the Museum situated nearby. Filming continues at Brownlow Hill, Renshaw Street, Hanover Street and at Liverpool One Bus Station before completing our film on this visit at Mann Island, Pier Head as the buses turn around in glorious sunshine in front of the world famous Liver Buildings. Here we see the latest additions to the Stagecoach fleet in the shape of ADL Enviro400 MMC double-deckers and new Volvo B5HL hybrid Wrightbus bodied double-deckers in the Arriva fleet wearing the current hybrid livery featuring bright green fronts and dark blue rears. Our second visit of the year took place in May 2017. Again with similar locations visited, but filmed from different angles due to the changed position of the sun. We also visited Crosshall Street, Victoria Street, North John Street and Dale Street. During 2017 Arriva had started to introduce a new livery across their UK bus fleets. We film both single and double-deckers in the new livery style during our May visit. The evening rush is recorded adjacent to the Liverpool One Bus Station and we conclude with some night-time scenes on Myrtle Street. 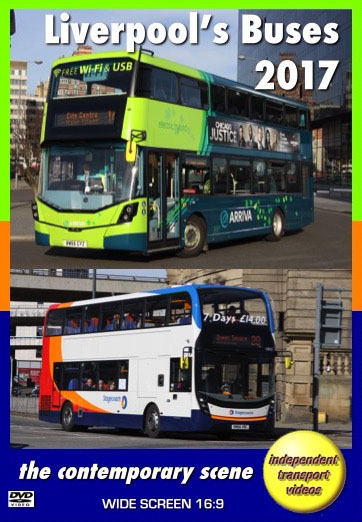 There is always something new and different with the buses in Liverpool, so come and enjoy “the contemporary scene” with us.